According to the University of Chicago Medicine, men and women shed an average of 50 to 100 hairs per day, and 90 percent of hair grows continuously. The other 10 percent stays in a "resting phase" for a few months until it sheds. However, some people experience more shed hair, or hair loss, than others. A number of things contribute to hair loss, including aging, hormones, stress, and illness. Other lesser known reasons for hair loss include excessive vitamin A intake and pattern baldness caused by hats, headbands, or eyeglasses. It is typically more prevalent along the hairline, or vertex, of the scalp. Thankfully there are number of hair loss treatments available in the hair care or vitamin section of most grocery and wellness stores. Next time, take a look at the main ingredient on the box of each product and you might notice one word that they all have in common: Minoxidil. Ryan Doss for Livestrong tells us how pattern baldness occurs--first, testosterone is converted into dihydrotestosterone or, DHT. Then, "it has the ability to bind to special receptors on hair follicles. Individuals with a genetic predisposition to male pattern baldness have similar receptors on the hair follicles in their scalp that, instead of promoting hair growth when bound by DHT, actually thin hair and cause hair loss." The National Institutes of Health (NIH) says "Minoxidil is used to stimulate hair growth and to slow balding." It prolongs the growth phase of hair follicles by widening them and prolonging the anagen stage of hair growth. This increases the density of the affected person's hair. The exact cause of how Minoxidil works on a physiological basis is still unknown but since being FDA-approved in 1988, this drug has been proven to show exceptional results in slowing hair loss. Originally intended as a blood pressure solution, Minoxidil topical now comes in pure form as a liquid with either an extender spray, dropper, or rub-on applicator for easy application to the scalp. Walgreens has a 2% women's Minoxidil topical solution in a 3-month supply. 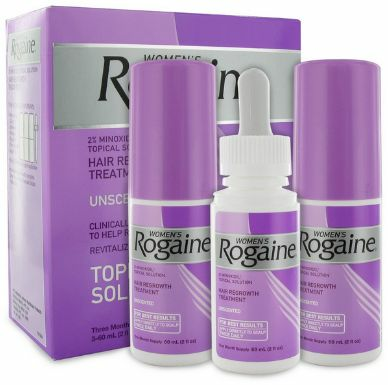 For men, Rogaine offers a 5% 3-month supply in the form of a foam. These companies usually advise to not exceed usage twice daily. It is important to know that overusing this drug will not produce faster results. Note: Ask your doctor before using topical Minoxidil. It is not to be confused with oral Minoxidil. This advice is not intended to be replaced with that of a licensed professional.